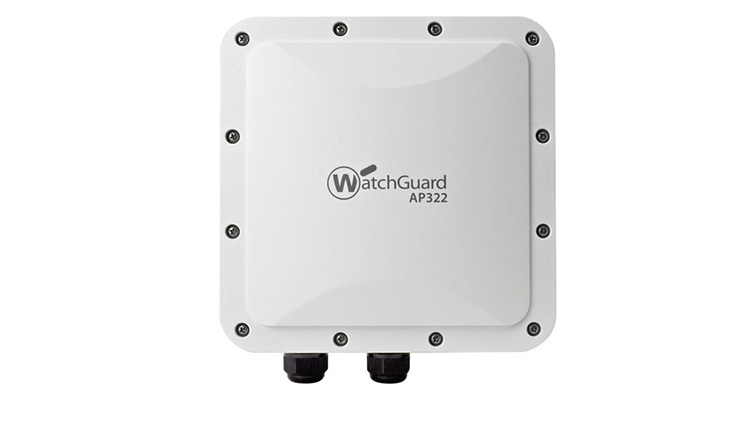 WatchGuard’s AP322 brings secure Wi-Fi to the outdoors! Its rugged, IP67-rated enclosure protects the access point from the wind, rain and cold weather, while 6 integrated antennas operate with 3 spatial streams per radio (3x3 MIMO) to deliver broad, fast, and reliable Wi-Fi coverage – making the AP322 ideal for stadiums and sports fields, schools/universities, malls, parks, hotel pool areas and open air cafes, shipping docks, warehouses and other harsh or outdoor locations. The AP322, like all of our new generation access points, can be managed by either WatchGuard’s Wi-Fi Cloud platform or the Gateway Wireless Controller (GWC) found inside of every Firebox appliance. Where other Wi-Fi platforms have tried and failed, use Wi-Fi Cloud’s patented WIPS to defend your airspace from Wi-Fi hacking without the risk of accidentally shutting down your neighbor’s Wi-Fi and running into legal trouble. Bridge the gap between online businesses and the physical, brick-and-mortar. Empower business owners and sales and marketing teams with location-based data on metrics such as dwell times, new vs. repeat visitors, and demographics on gender and age. Provide unique experiences for guests and customers and turn Wi-Fi into a key marketing tool that transforms visits into customer touchpoints, increases fans on social networks, and allows for continued engagement after people leave. Easily scale from one to an unlimited number of APs across multiple locations without worrying about the hardware limitations of legacy controller infrastructure. APs can be grouped in many ways including location, buildings and floors, for easy management and policy configuration.